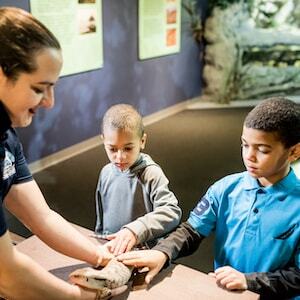 When you visit the Greater Cleveland Aquarium you can discover amazing aquatic creatures and indulge your natural curiosity at our two touchpools and through our up-close animal encounters, “Dish on Fish” aquarist talks, daily underwater “Sharks & Scuba” Q&As with our dive team or by feeding our stingrays. Crave something more? Interactive opportunities abound. You can schedule a ZZZs in the Seas overnight and sleep beneath the sharks. You can paint an original work of art with our stingrays as part of their enrichment. You can even sneak a peek behind-the-scenes to see the life support systems that keep the Aquarium running. 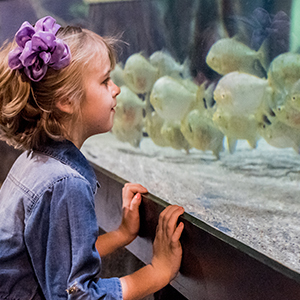 Check out what’s going on at the Aquarium everyday. Plan something fun for you or a special someone. 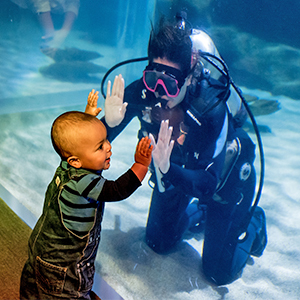 If you’re Scuba certified you can dive with sharks inside our 230,000-gallon exhibit. Want to make a big splash? 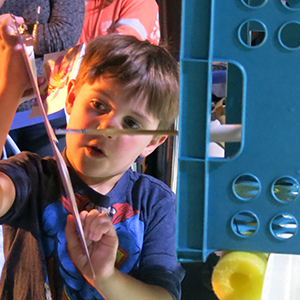 Plan your child’s birthday party at the Aquarium. Looking to celebrate a milestone moment? 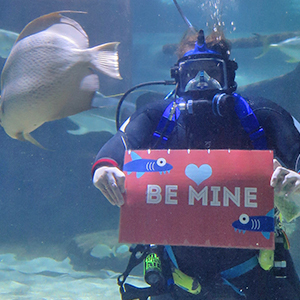 Commemorate a big event with a special message positioned by our shark gallery divers. Bring your class for a memorable learning experience. We have an array of daytime and evening programs perfect for every age and interest.